A quick chicken stir-fry that combines a peanut sauce, chicken and vegetables and can be ready from start to finish in 30 minutes. Mix all ingredients except vegetable oil, chicken and vegetables until blended. Heat vegetable oil in nonstick wok or large skillet on medium-high heat. Add chicken; stir fry 4 min. or until no longer pink. Add mushrooms and sweet peppers; stir-fry 4 to 5 min. or until chicken is done. Add peanut sauce and snow peas; stir-fry 1 to 2 min. or until heated through. 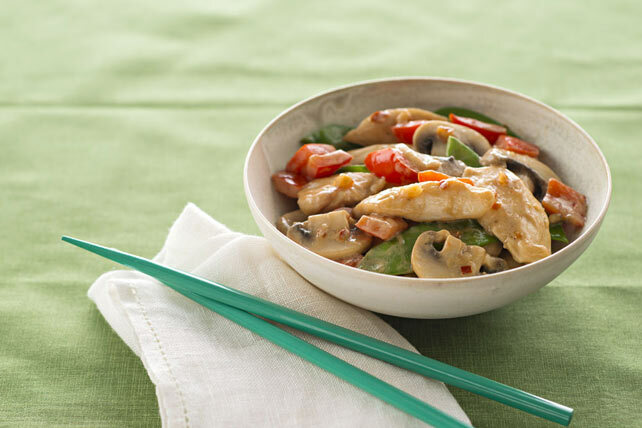 Substitute your family's favourite choice of vegetables for the mushrooms, sweet red peppers and/or snow peas. For added colour and flavour, top with 2 Tbsp. each chopped dry roasted peanuts and fresh cilantro before serving.